“Dirty” power: The world’s largest health experiment. Electricity today is not a simple 60 Hz electrical signal. The increased use of modern electronics and other non-linear, time-varying loads has over-loaded the distribution system with high-frequency electrical pollution that causes “dirty” power. “Dirty” power is widely recognized to be a problem for industry. The July 5, 1999 issue of Fortune states that “Dirty power costs U.S. industry anywhere from $4 billion to $6 billion a year, according to Karl Stahlkopf, a vice president at the utility financed Electric Power Research Institute (EPRI).” Alliant Energy even sent out an informational leaflet in electrical bills entitled “Energy Basics: Power Surges” which states “Low-level power surges won’t melt parts or blow fuses, but they can cause “electronic rust,” gradually degrading internal circuitry until it ultimately fails.” and “Small surges won’t leave any outward evidence, so you may not even be aware they’re happening – even though they may occur dozens or even hundreds of times each day. ” During day to day living countless finely tuned electrically mediated reactions occur constantly in order to keep our bodies running. It is unreasonable to believe that “dirty” power can cause substantial damage to home electronics and industrial equipment and not affect the finely tuned electrical interactions in our bodies. In fact, the findings in the paper Dirty Electrical Power Affects Cows (condensed from “Relationship of Electric Power Quality to Milk Production of Dairy Herds,” in press, by Donald Hillman, Dave Stetzer, Martin Graham, Charles L. Goeke, Kurt Mathson, Harold H. VanHorn, and Charles J. Wilcox) show that the number of high frequency events correlates closely with milk production e.g. greater numbers of high frequency events correlated with lower milk production and lower numbers of high frequency events correlated with higher milk production. Dr. Robert Kane suggests a link between exposure to radio frequencies and the rise in autism in his recently published paper “A Possible Association Between Fetal/neonatal Exposure to Radiofrequency Electromagnetic Radiation and the Increased Incidence of Autism Spectrum Disorders”. In addition to causing health problems directly, this high-frequency pollution also leads to another source of problems: ground currents. In the 1950’s, the National Electrical Safety Code (NESC) required a neutral wire to return current to the utilities. This was not required in rural areas until 1960. It is forbidden by the NESC 92D for the earth to be used as the neutral return. In fact, on page 152 of the NESC Handbook Fourth Edition it says, “When earth returns were used in some rural areas prior to the 1960’s they became notorious offenders in dairy areas because circulating currents often caused both step and touch potentials.” It concludes “these have adversely affected milking operations by shocking the cattle when they were connected to the milking machines, and have affected feeding.” These are exactly the issues that farmers face today. How can there be dairy or human health problems due to electricity returning through the earth, since we do have a neutral wire now? The Public Service Commission (PSC) has allowed the utilities to install grounding rods on the neutral return wire, instead of increasing the size of the neutral wires. (Overloading of the wires is a fire hazard and installing grounding rods is less costly on a short-term basis than upgrading the neutral.) Current then flows down the grounding rods and through the earth back to the substation when the wire is over loaded. A Minnesota study found that over 70% of the current returns to the substation via the earth in some areas. Dr. Duane Dahlberg’s paper entitled “Why Ground Currents” briefly discusses the origin and health ramifications of electrical ground currents citing many industry , university, and independant studies. In 1957, 10 billion Kilowatt-hours of electricity were sold statewide. In 2000, 65 billion Kilowatt-hours of electricity were sold statewide. Assuming problems occurred prior to 1960 with a total earth neutral return, all current returning via the earth, 10 billion Kilowatt-hours of electricity flowing through the earth caused health problems for cattle. Now, assuming that 70% of the electricity returns via the earth in 2000, there are 45 billion Kilowatt-hours returning through the earth in 2000. This means that there is nearly five times as much electricity returning through the earth now than there was in 1957. In effect, we are being exposed to more electrical pollution now than we were in the 1950’s when the neutral wire became a requirement. These numbers show conclusively why loopholes need to be closed and better enforcement of the regulations is needed. According to the NESC no objectionable current flow is allowed down the grounding rod, however the NESC left objectionable without a numerical definition. This has left it up to individuals to prove that current flow that occurs is objectionable. Legislation like Wisconsin Rep. Barbara Gronemus’s (2003 Assembly Bill AB529) and (2001 Assembly Bill 754) would take the onus off of individuals by providing a concrete definition of objectionable i.e. “a steady state of current for five seconds or more.” Defining objectionable in this manner means there would be no current flow allowed on the neutral grounding wire except under fault conditions e.g. lightening strikes. Why do we need larger neutral wires compared to phase or “hot” wires? We use power differently today than in the 1950’s. An increasing percentage of electricity is used for non-linear, time-varying loads (e.g. electronics like TVs or computers, dimmer switches, and variable speed motors). 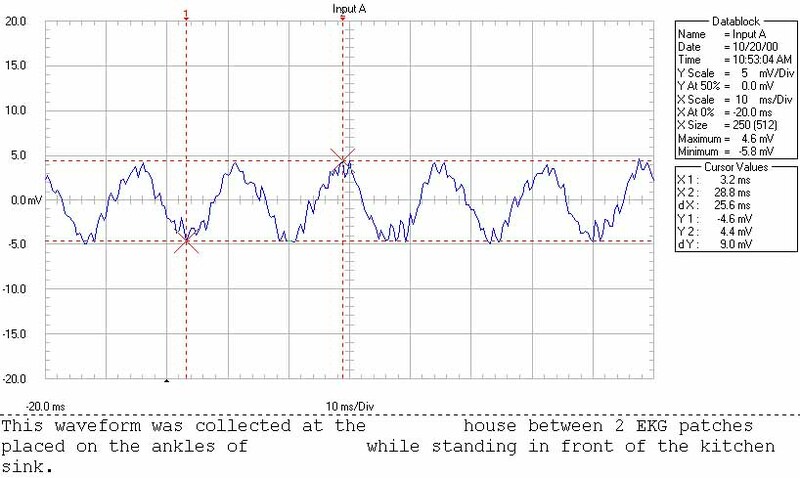 Non-linear, time-varying loads distort the sine wave causing high frequencies. The distorted sine wave or “dirty” power sees a higher resistance on the wire, so a larger return wire is necessary. The Institute of Electrical and Electronics Engineers (IEEE) addressed this in the IEEE Standard 519-1992 which states that modern loads require a neutral wire 225% of the size of the phase wires. At this time in the United States, it is unusual for the neutral wire to even be the same size as the phase wires. Most of the neutrals are half the size of the phase wires. The electricity that cannot flow on the neutral, because the neutral is too small, travels back to the substation through the earth. Can anything be done besides increasing the size of the neutral? Yes, in addition to outlining the sizing of the neutral necessary for modern electronic loads, the IEEE 519-1992 discusses other techniques for improving power quality. It addresses the use of filters to decrease distortion. It also grants the utilities the right to deny service to major power-quality polluters if they do not clean up the power to certain specifications before they return it to the line. This can be done relatively inexpensively at the source and would substantially relieve the overloading of the neutral wire. At this time few of the utilities in the United States have exercised that right. How can there be zero current on the neutral grounding wires? There are isolation devices that allow current down the down-grounds in fault or lightening situations, but would act like an open circuit (an example of an open circuit is a light switch in the off position) under normal circumstances. Installation of these devices on all the down grounds would be one way to ensure no current returns to the substation via the earth while maintaining the safety benefits of a grounded system. How does “dirty” power affect you? Unlike the electrical earth currents of the 1950’s, electrical earth currents today are not a clean 60 Hz sine wave. They are as “dirty” with high frequencies as the power that returns to the substation. They are the return current that does not flow on the wire. As the prevalence of non-linear, time-varying loads increases, the return power and the earth currents get dirtier. High frequencies cause health problems at very low voltages in part because the energy is higher with higher frequencies. Because of the high frequencies, modern electrical ground currents are actually worse for you at the same voltage than the “clean” electrical earth currents that caused problems in the 1950’s. Ground Currents: An important factor in electromagnetic exposure by Dr. Duane Dahlberg deals in detail with the importance of exposure to electrical ground currents. We are all in contact with electrical ground currents when we do such everyday activities as wash the dishes, shower, or sit on the lawn. Did the utilities ask your permission to make you part of an electrical circuit? It only takes 80 microamps to stop a human heart. 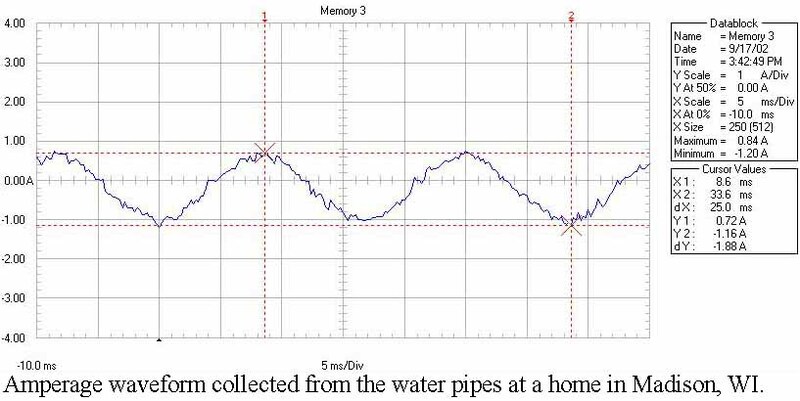 The waveform from the water pipes is 1.88 Amps. This is 23,500 times the current required to stop a human heart. It is 3,760 times the current required to exceed the ICNIRP standards for exposure of the general public. 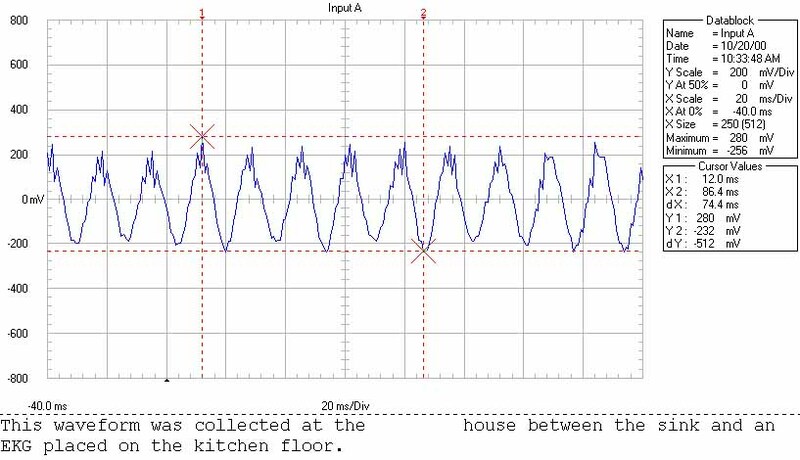 Voltage waveform in a woman’s body from ankle to ankle while standing on a linoleum kitchen floor. Voltage waveform from her sink to linoleum kitchen floor. 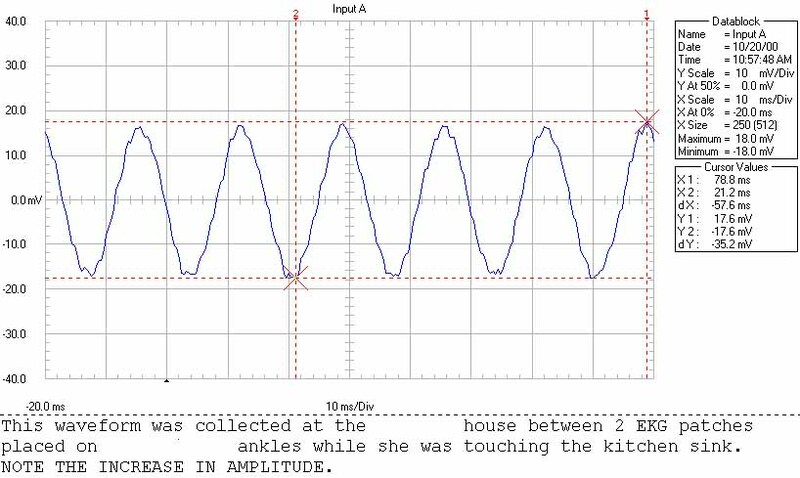 Voltage waveform in a woman’s body from ankle to ankle while standing on a linoleum kitchen floor and touching sink. In addition to being part of an electrical circuit because of the electrical earth currents, each person is capacitively coupled to the wires running around them through the walls, floor, and ceiling of the building where they live or work. Electrical engineers know about capacitive coupling, but they have also been taught that the result is insignificant. They have not read or choose to ignore publications like Cross Currents by Robert O. Becker, MD in which he discusses the extreme sensitivity of the human body to electromagnetic fields/radiation and Electromagnetic Fields and the Life Environment by Karel Marha, Jan Musil, and Hana Tuha in which they describe the symptoms humans experience with chronic exposure to high frequencies. The description of the symptoms of exposure to high frequencies in Electromagnetic Fields and the Life Environment touches on all of the most minor and puzzling symptoms of Chronic Fatigue Syndrome (CFS), as well as, all of the widely accepted ones. 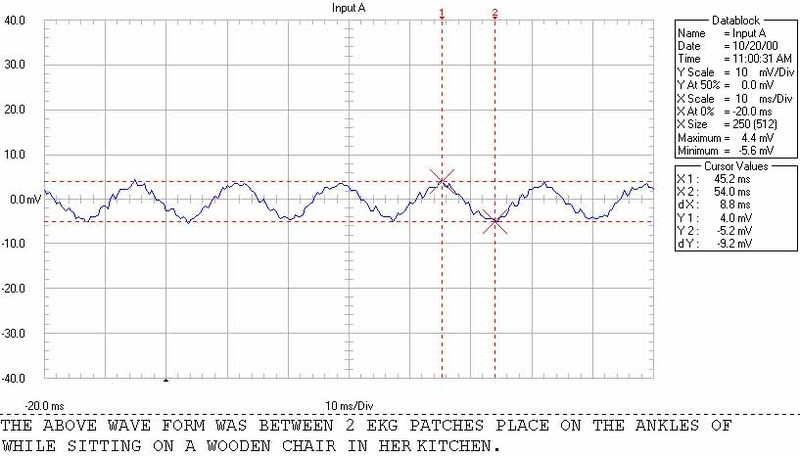 Voltage waveform in a woman’s body from ankle to ankle while sitting on a wooden chair in her kitchen with her legs on the chair demonstrating effect of capacitive coupling. Neurological: headaches, dizziness, nausea, difficulty concentrating, memory loss, irritability, depression, anxiety, insomnia, fatigue, weakness, tremors, muscle spasms, numbness, tingling, altered reflexes, muscle and joint paint, leg/foot pain, “Flu-like” symptoms, fever. More severe reactions can include seizures, paralysis, psychosis and stroke. Can “dirty” power cause over-billing? Yes, “dirty” power can cause the utilities to over-bill you for the power you use. The standard disk-type electrical rate meters were designed for “clean” 60 Hz power. They are standardized for measuring “clean” 60 Hz power. With the dramatic increase in non-linear, time-varying loads the power that is delivered to your house or business is no longer “clean” power. The “dirty’ power can cause the rate meters not designed for use with “dirty” power to read inaccurately.